Manchester United head into the first Manchester derby of 2013 in a position they could have only dreamed of at the start of the campaign, following Manchester City’s inability to replicate their fantastic form and free flowing football of their title winning campaign last year, the red side of Manchester find themselves fifteen points ahead of Mancini’s men with only eight games left to play. When the sides first met at Eastlands in December, Manchester City were still unbeaten in the League and despite a poor continental campaign in the Champions League, were looking destined to retain their Premier League crown, however a defeat that day following a last gasp Robin Van Persie free kick sent City into a downward spiral with Mancini’s side unable to string together impressive performances on a regular basis. What do you think will happen? Why not use bwin’s offer for EPL Index readers and take advantage of a free £20 bet? Following Sir Alex Ferguson’s heavy praise of Phil Jones this morning coupled with United’s defensive injuries, I suspect Jones may get a starting position at centre half on Monday. It was expected that Manchester City would be able to close the gap on United with the Blues out of European competition whilst United were still involved, however defeat to Real Madrid in the first knockout round has meant this wasn’t the case. Manchester United have continued to stretch their lead at the top of the table only dropping points away at Spurs in recent months whilst Manchester City have suffered defeat at Southampton and Everton. Despite the title race in the eyes of many being all but over there has still been plenty of rhetoric to stoke the fire of the rivalry between the two clubs ahead of Monday’s clash at Old Trafford with Roberto Mancini stating United deserved to be at the top of the table but not by fifteen points, Aleksandar Kolarov telling the media that City were still the best team in Manchester whilst City captain Vincent Kompany has urged his side to defeat rivals United on Monday and thus winning the battle of Manchester if they cannot win the title. Wayne Rooney is set to return to the Manchester United team after missing the trips to Sunderland and Chelsea in the League and FA Cup respectively last weekend through a groin strain, Brazilian right back Rafael is also set to return after missing the match against Chelsea through an injury picked up against Sunderland. Sir Alex Ferguson confirmed in his pre match press conference this morning that Nemanja Vidic and Jonny Evans are 50-50 to make the Manchester derby on Monday evening which leaves Sir Alex Ferguson with a few decisions to make with regards to his defensive combination for Monday. After yet another injury it is expected summer signing Jack Rodwell may return to the City squad on Monday following a hamstring complaint whereas Micah Richards and Maicon have both been ruled out. After picking up minor knocks in the last match against Newcastle United, both David Silva and Samir Nasri have been confirmed to be back at full fitness and will play at Old Trafford. Matija Nastasic is also expected to make a return to the Manchester City starting line-up. 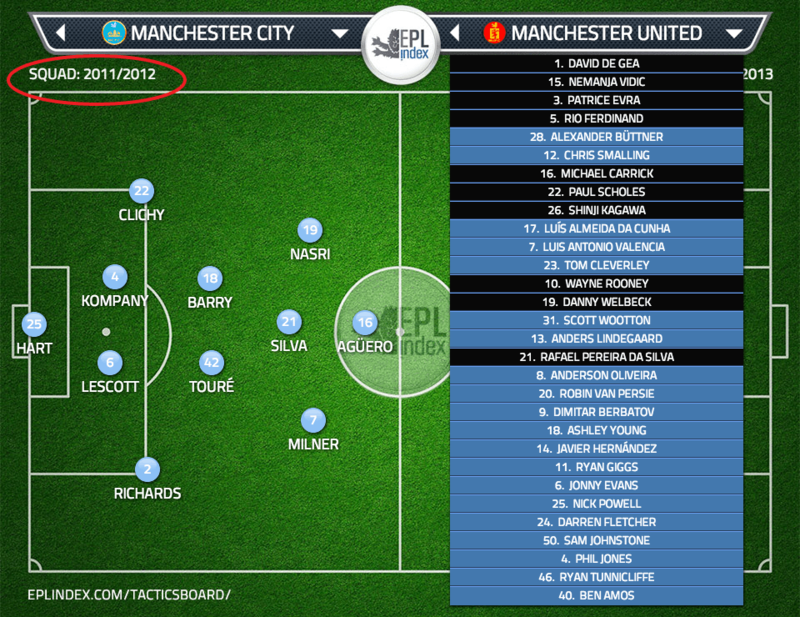 Monday will be the 166th contested Manchester Derby since the first in November 1881. Ryan Giggs still holds the most Manchester Derby appearances with 35 however it is expected Giggs will make this 36 on Monday evening. Last season’s 6-1 victory for Manchester City at Old Trafford was not the first time they won by that score line at the home of their neighbours with City running out 6-1 victors at Old Trafford in January 1926. Following a great deal of criticism in his first and a quarter seasons as Manchester United’s number one goalkeeper, David De Gea has been arguably the best goalkeeper in the Premier League in 2013 with the Spaniard looking increasingly more confident in the taking of aerial crosses. The turning point was in his home country, the first leg against Real Madrid at the Bernabeu, De Gea pulled of a number of top quality reflex saves and has since taken this form onto the domestic scene with De Gea proving to be a reassuring presence to a United backline that hasn’t conceded a goal in their last six Premier League games. With Manchester City having a significant amount of attacking firepower at their disposal in the form of Tevez, Aguero, Silva, Yaya Toure and Samir Nasri, De Gea will certainly be called upon to make saves on Monday evening. After a turbulent fortnight between Manchester City and Yaya Toure where their Ivorian midfielder has missed a match trough a headache and also a dispute between a new contract has emerged in the media it is hoped by all to do with Manchester City that all these issues have been put to an end following Toure’s decision to sign a new contract with the Champions on Thursday. Toure will be hoping to continue his good form against Manchester United with the Ivorian often enjoying matches against Manchester United with the former Barcelona man able to use his physical power to complete breakthrough Manchester United’s at times lightweight midfield. However with the improved fitness and performances of Michael Carrick this season it may not be Toure who has it all his own way on Monday evening yet I am sure he is the player of Manchester United are most fearful of heading into Monday’s Manchester Derby. 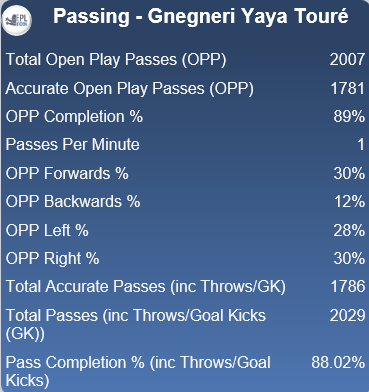 Yaya Toure has also been one of the most accurate passes in this year’s Premier League with the Ivorian having a fantastic 88% completion rate. 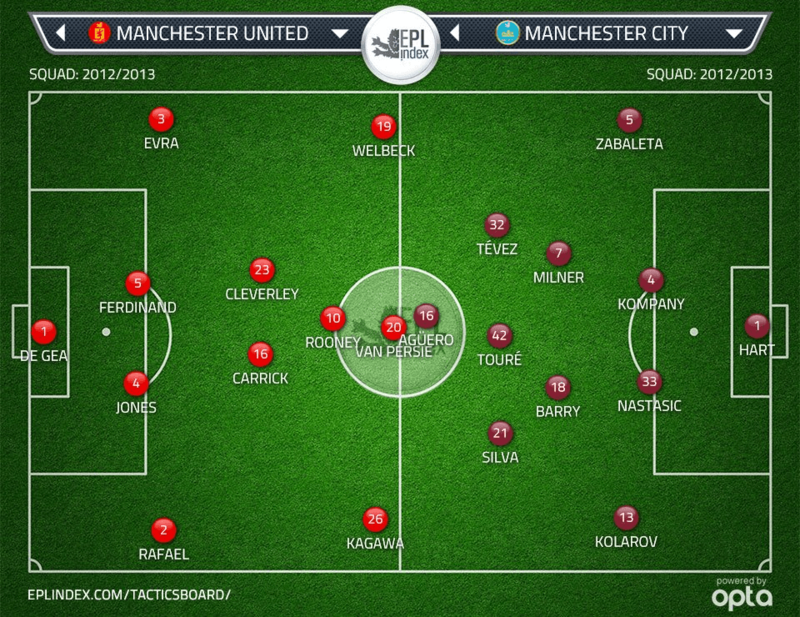 Categories: Manchester City (NN), Manchester Utd (NN), and Premier League News.' 'Tags: "Manchester United", David de Gea, english Premier league, English Premier League Opta Stats, English Premier League Stats, EPL, epl opta stats, EPL Stats, Manchester City, Manchester Derby, Manchester United Vs Man City Preview, Manchester United Vs Manchester City Preview, MUFC Vs MCFC Match Preview, Old Trafford, opta, Opta Stats, Phil Jones, premier league, premier league opta stats, Roberto Mancini, Sergio Aguero, and Yaya Toure.